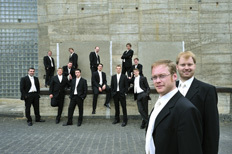 The male vocal ensemble Camerata Musica Limburg was founded in 1999 and has since been under the musical direction of Jan Schumacher. The choristers saw the formation of the choir as a further development of their shared roots as they all started singing with the Limburg Cathedral boys choir. They also wanted to continue the tradition of successful male chamber choirs founded by former members of Limburg Cathedral boys choir, which is unique throughout Germany. The ensemble has committed itself to present the audience with unfamiliar works of male choir literature of the highest level, but without neglecting the traditional canon of compostitions which results in a very special mixture. The repertoire ranges from Gregorian chants and works of old masters to romantic motets, contemporary compositions and arrangements of jazz and pop songs. The intensive study of new choir music resulted in numerous compositions that were wrote especially for the Camerata Musica Limburg. The repertoire ranges from Gregorian chants and works of old masters to romantic motets, contemporary compositions and arrangements of jazz and pop songs. The intensive study of new choir music resulted in numerous compositions that were wrote especially for the Camerata Musica Limburg. Thanks to its excellent reputation, the choir was invited to festivals and concerts all over Germany and Europe like the Cathedral Concerts in Münster‘s St. Paul‘s Cathedral or to the Rhineland-Palatinate Summer of Culture “VokalStern” event and the Church Music Festival in Nuremberg as well as the International Thracian Choral Festival in Bulgaria. In 2004 Camerata Musica Limburg won the title of „best classical choir of the year“ awarded by Hessian Broadcasting. The ensemble was a first prize winner at the renowned Tours Vocal Competition „Florilège Vocal“ (France) in 2006 and won another first prize in 2007 at the International Choir Contest in Vlaanderen- Maasmechelen (Belgium), where the choir was also awarded a special prize for ist outstanding interpretation of the contemporary compulsory works. At the Choir Festival Contest in Bremen in May 2008 the choristers won first prizes in the categories Romanticism A and Modernity A and were awarded the choir festival’s special prize by Deutschlandradio Kultur.